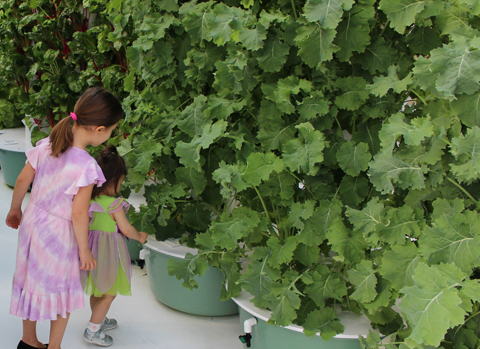 Fortunately, there’s a solution: vertical aeroponics — the soil-free growing technology that powers Tower Farms. 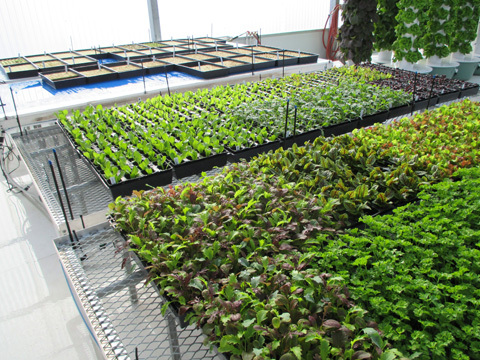 An advanced form of hydroponics, aeroponics is the process of growing plants with only water and nutrients. This innovative method results in faster growth, healthier plants, and bigger yields — all while using fewer resources. 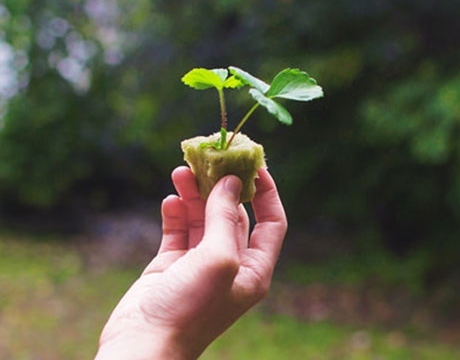 Plants grow in a soilless medium called rockwool. A 20-gallon reservoir holds a liquid nutrient solution made of water and earth minerals. 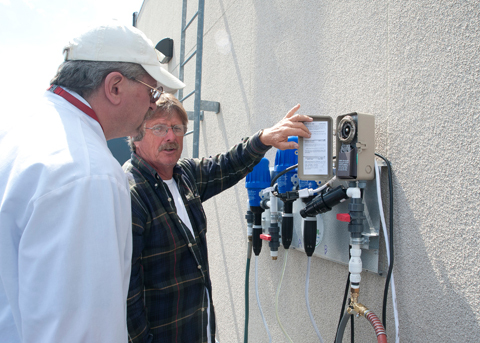 Controlled by a timer, a low-wattage submersible pump propels the nutrient solution to the top of the tower. Nutrient solution cascades down the inside of the tower, oxygenating and feeding exposed plant roots. 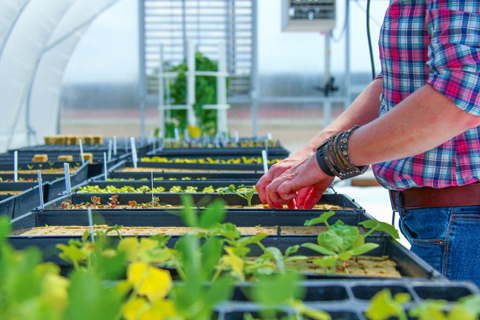 Agriculture is a thriving industry — new farming businesses are sprouting up all over the world. 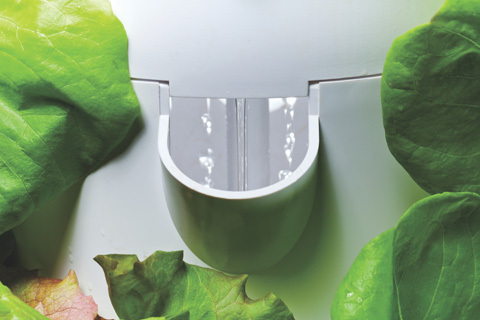 You can grow food in a variety of unlikely places — indoors and out — thanks to the unique design of our vertical aeroponic growing systems. To get started, all you really need is about 200 square feet, a clean water source, electrical outlet, and sunlight (or grow lights). Get farm financing and cut startup costs by 75%. 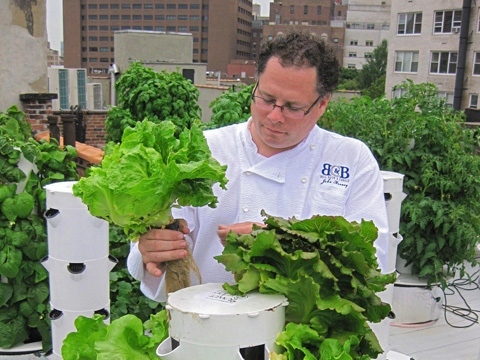 Tower Farms makes urban agriculture more accessible. In fact, you can get growing with a down payment of only 25%. Maximize yields in minimal space with up to 250,000 plants per acre. Deliver 30% more product to market, 3x faster. 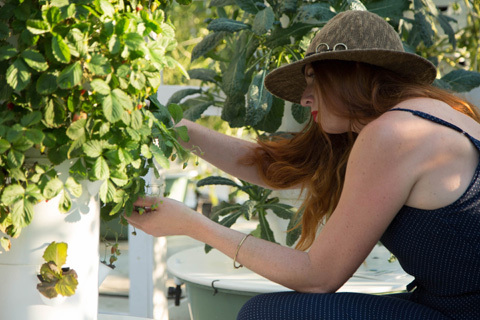 The Tower Farms aeroponic growing process produces up to 30% greater yields3 3x faster compared to traditional farming methods.4 For most herbs and leafy greens, the seedling to harvest cycle can be as short as 21 days. 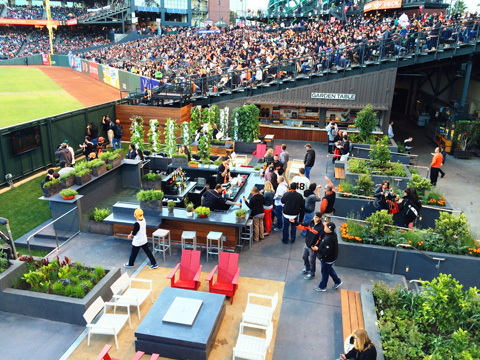 Grow sustainably and use up to 98% less water. 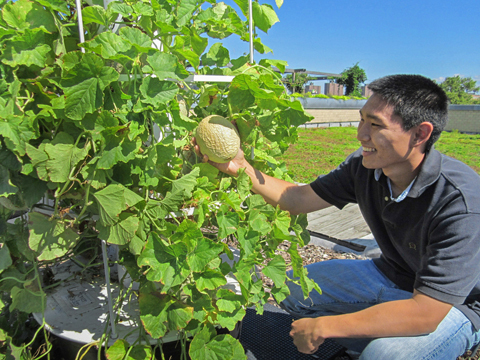 With closed-loop technology, Tower Farms systems recycle water and nutrients. In turn, they use up to 98% less water than conventional farms, which is especially critical for those growing in drought-stricken regions. Choose from more than 150 plants. 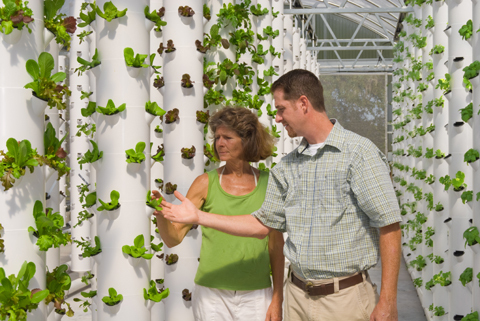 Many hydroponic farming systems limit what you can grow. But Tower Farms supports more than 150 different plants — from delicate herbs and greens to hearty fruiting crops, such as tomatoes and squash. As a result, you can adapt your crop selection strategy on the fly to meet market demand. Cultivate a superior product that sells at a premium price. Invest in a farm that lasts a lifetime. Unlike most white plastics used in agriculture — which degrade with time and solar radiation — the FDA food grade-compliant, UV-stabilized plastic we use is designed to survive decades. So you can focus on farming, not replacing equipment every season. By growing crops off the ground, you reduce the risk of soil-borne pests and plant diseases. 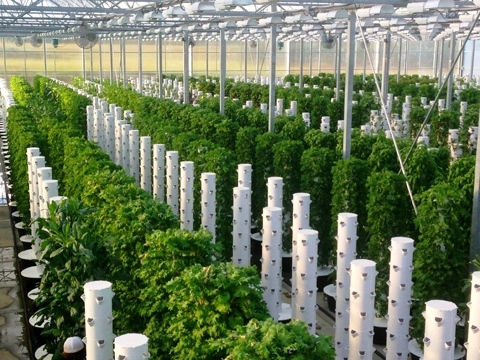 And since each tower grows independently, you can isolate and address any issues that do arise without jeopardizing your entire farm (unlike many hydroponic systems, which connect growing units to a common reservoir — allowing problems to spread and wipe out a farm overnight). The Tower Farms turnkey vertical aeroponic farm comes with everything you need to get growing. And since the system is modular, you can start small with only a few towers, safely test the market and perfect your approach, and then scale up your farm (and success) when you feel ready. Control the growing climate and ensure reliable results. For soil-based farmers, a change in weather can be the difference between a record harvest and a debilitating season. But with Tower Farms, you never have to worry about droughts or floods. And if you grow indoors or in a greenhouse, you can even control temperature, light, humidity, and other variables to consistently produce predictable yields, regardless of the weather. Farming is hard work. But Tower Farms makes it easier by automating feeding and watering cycles, eliminating weeding and digging, and minimizing pest risk. And if you need help along the way, you’ll have full access to our farming resources and guidance from fellow farmerpreneurs. 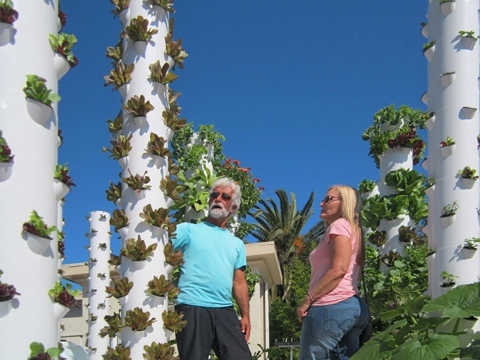 Ready to start your own vertical aeroponic farming adventure?